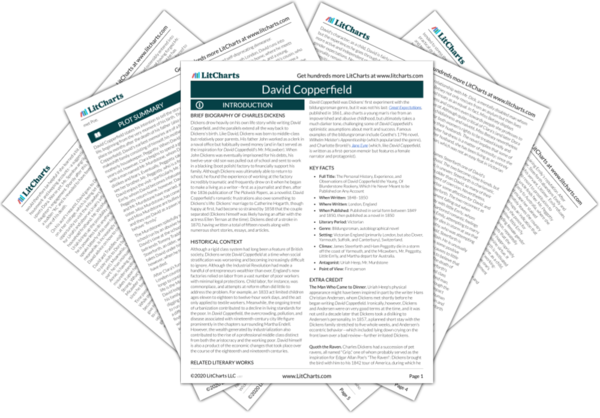 Instant downloads of all 946 LitChart PDFs (including David Copperfield). 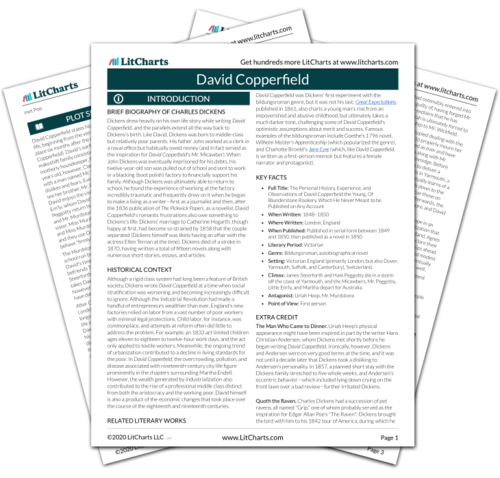 Welcome to the LitCharts study guide on Charles Dickens's David Copperfield. Created by the original team behind SparkNotes, LitCharts are the world's best literature guides. A concise biography of Charles Dickens plus historical and literary context for David Copperfield. A quick-reference summary: David Copperfield on a single page. In-depth summary and analysis of every Chapter of David Copperfield. Visual theme-tracking, too. Explanations, analysis, and visualizations of David Copperfield's themes. David Copperfield's important quotes, sortable by theme, character, or Chapter. Description, analysis, and timelines for David Copperfield's characters. Explanations of David Copperfield's symbols, and tracking of where they appear. An interactive data visualization of David Copperfield's plot and themes. Dickens drew heavily on his own life story while writing David Copperfield, and the parallels extend all the way back to Dickens's birth. Like David, Dickens was born to middle-class but relatively poor parents. His father John worked as a clerk in a naval office but habitually owed money (and in fact served as the inspiration for David Copperfield's Mr. Micawber). When John Dickens was eventually imprisoned for his debts, his twelve-year-old son was pulled out of school and sent to work in a blacking (boot polish) factory to financially support his family. Although Dickens was ultimately able to return to school, he found the experience of working at the factory incredibly traumatic and frequently drew on it when he began to make a living as a writer—first as a journalist and then, after the 1836 publication of The Pickwick Papers, as a novelist. David Copperfield's romantic frustrations also owe something to Dickens's life: Dickens' marriage to Catherine Hogarth, though happy at first, had become so strained by 1858 that the couple separated (Dickens himself was likely having an affair with the actress Ellen Ternan at the time). Dickens died of a stroke in 1870, having written a total of fifteen novels along with numerous short stories, essays, and articles. Although a rigid class system had long been a feature of British society, Dickens wrote David Copperfield at a time when social stratification was worsening and becoming increasingly difficult to ignore. Although the Industrial Revolution had made a handful of entrepreneurs wealthier than ever, England's new factories relied on labor from a vast number of poor workers with minimal legal protections. Child labor, for instance, was commonplace, and attempts at reform often did little to address the problem. For example, an 1833 act limited children ages eleven to eighteen to twelve-hour work days, and the act only applied to textile workers. Meanwhile, the ongoing trend of urbanization contributed to a decline in living standards for the poor. In David Copperfield, the overcrowding, pollution, and disease associated with nineteenth-century city life figure prominently in the chapters surrounding Martha Endell. However, the wealth generated by industrialization also contributed to the rise of a professional middle class distinct from both the aristocracy and the working poor. David himself is also a product of the economic changes that took place over the course of the eighteenth and nineteenth centuries. David Copperfield was Dickens' first experiment with the bildungsroman genre, but it was not his last: Great Expectations, published in 1861, also charts a young man's rise from an impoverished and abusive childhood, but ultimately takes a much darker tone, challenging some of David Copperfield's optimistic assumptions about merit and success. Famous examples of the bildungsroman include Goethe's 1796 novel, Wilhelm Meister's Apprenticeship (which popularized the genre), and Charlotte Brontë's Jane Eyre (which, like David Copperfield, is written as a first-person memoir but features a female narrator and protagonist). Setting: Victorian England (primarily London, but also Dover, Yarmouth, Suffolk, and Canterbury), Switzerland. Climax: James Steerforth and Ham Peggotty die in a storm off the coast of Yarmouth, and the Micawbers, Mr. Peggotty, Little Em'ly, and Martha depart for Australia. The Man Who Came to Dinner. Uriah Heep's physical appearance might have been inspired in part by the writer Hans Christian Andersen, whom Dickens met shortly before he began writing David Copperfield. Ironically, however, Dickens and Andersen were on very good terms at the time, and it was not until a decade later that Dickens took a disliking to Andersen's personality. In 1857, a planned short stay with the Dickens family stretched to five whole weeks, and Andersen's eccentric behavior—which included lying down crying on the front lawn over a bad review—further irritated Dickens. Quoth the Raven. Charles Dickens had a succession of pet ravens, all named "Grip," one of whom probably served as the inspiration for Edgar Allan Poe's "The Raven": Dickens brought the bird with him to his 1842 tour of America, during which he met Poe. Beaumont, Lily. "David Copperfield." LitCharts. LitCharts LLC, 7 Oct 2018. Web. 11 Dec 2018. Beaumont, Lily. "David Copperfield." LitCharts LLC, October 7, 2018. Retrieved December 11, 2018. https://www.litcharts.com/lit/david-copperfield.